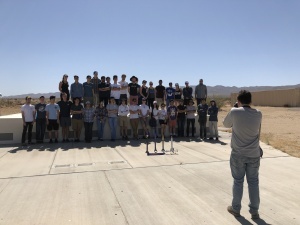 The RRS held a launch event at our private Mojave Test Area (MTA) with the students and staff of UCLA on Saturday, June 2, 2018. 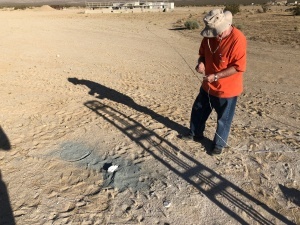 The event was overseen by our pyro-op, Jim Gross, with me serving as his apprentice. 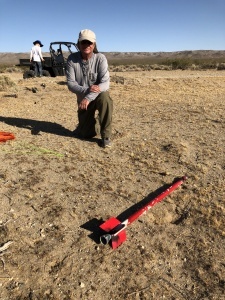 It was a good day for rocket launching despite the 100 degree temperatures that day. The winds were very low and almost still at certain times. 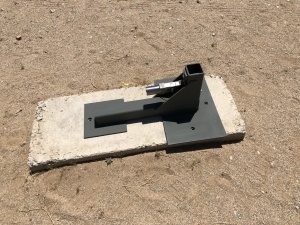 The horizontal thrust stand was fit checked at the RRS MTA concrete slab. All footplate holes aligned with the 1/2″-13 female anchor bolt holes. 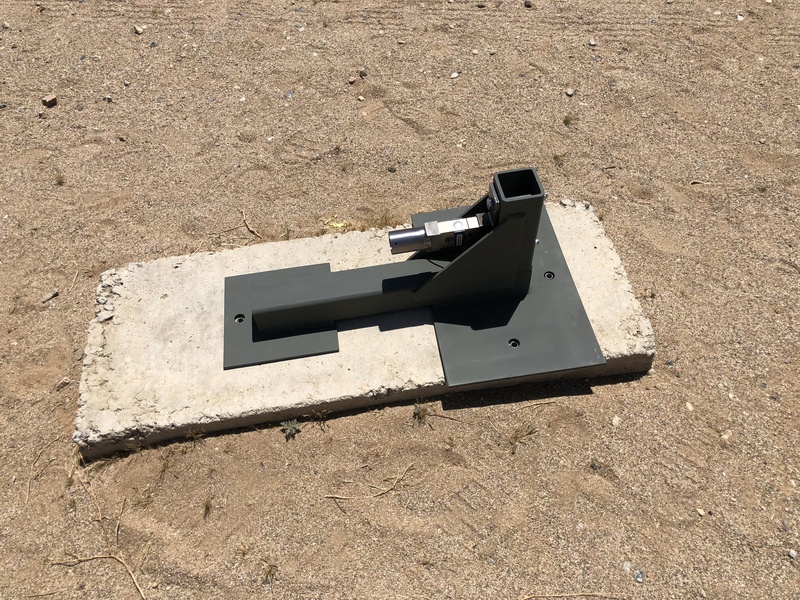 The load cell blocks mated up to the adapter plates. 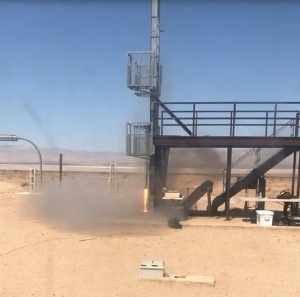 Concern was raised about the horizontal stability “wagging” of an alpha rocket if it were fired in the adapter as is. Osvaldo started a design to create an extension on the thrust stand which will better retain the rocket from excessive side loading. UCLA was completing a quarterly course in rocketry which featured the hard work of five student teams building their own amateur rocket using commercial F-class motors of different types. The RRS was able to inspect each one of these model rockets and ask questions of the team members about its construction and the unique aspects used in their payload and vehicle design. Each of the teams ran flight stability tests at the UCLA wind tunnel to validate their design. 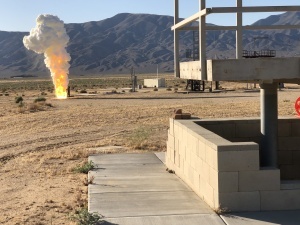 Each rocket was fired from a rail launcher and a commercial firing circuit under the supervision of the pyro-op. Before the flights of the student rockets, a test rocket was flown to check the wind speeds. 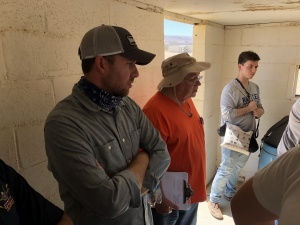 Results showed low winds so the team flights proceeded. 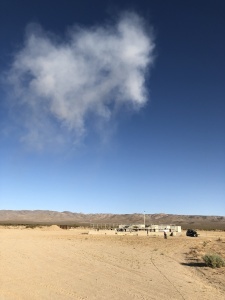 The winds at the launch site in the desert were very low throughout most of the day. 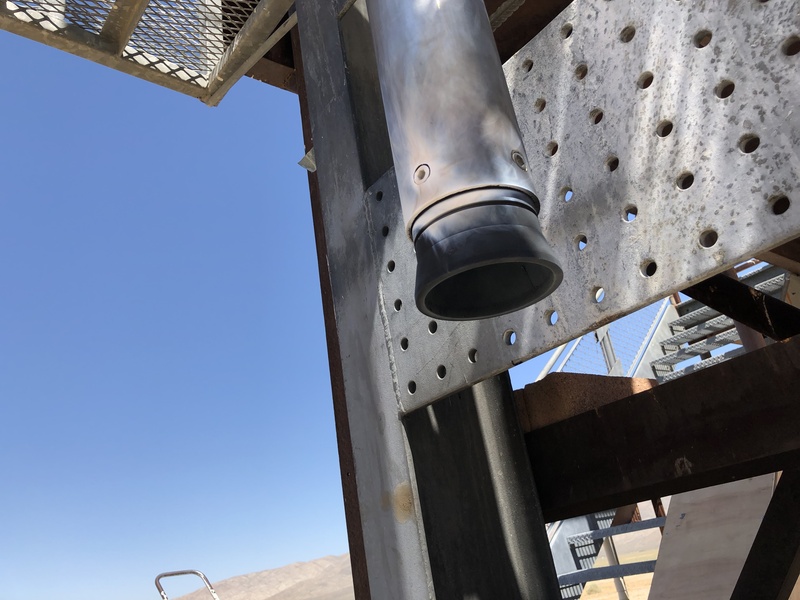 UCLA’s demo rocket to test winds before team flights. 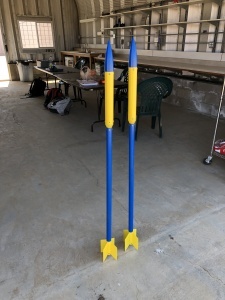 One team attempted a two-stage rocket using a D-class motor in Stage 2. Results from all rockets were largely good. All were recovered and some were able to be relaunched. 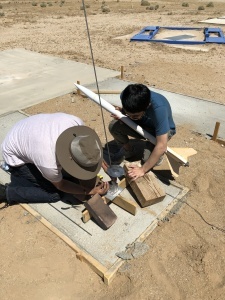 UCLA’s Team Sharky prepare their rocket “Bruce” for his maiden voyage. 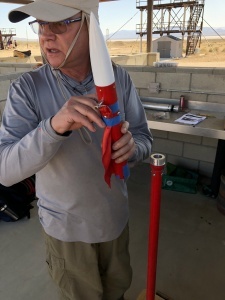 Each rocket flew an egg as a payload with a parachute recovery system. 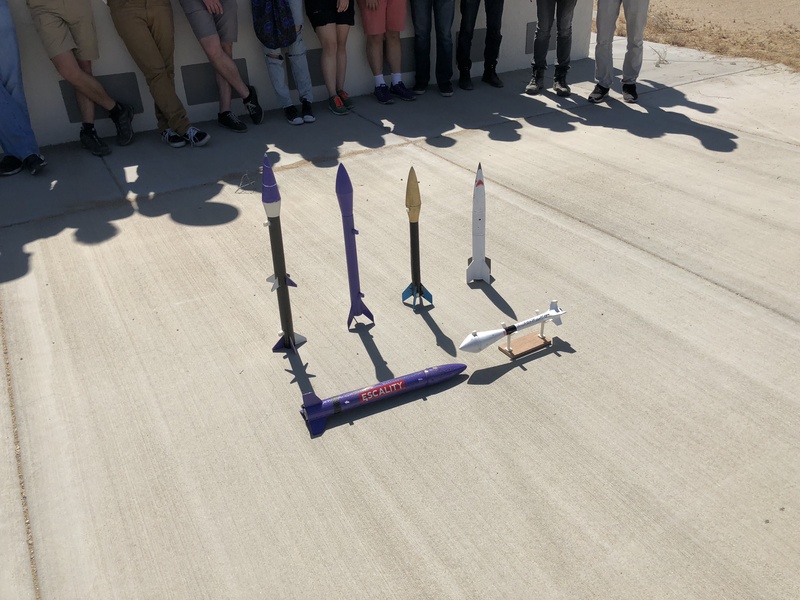 Each rocket also included a commercial altimeter chip which relayed the results to display on a cellphone application. Altitudes ranged from 1600 to 2400 feet. UCLA also was static testing a hybrid motor adapted from commercial products to a design of their own. Two vehicle systems were built and alternately tested with replaceable HTPB-based fuel grain modules. UCLA brought a few nitrous oxide tanks to replenish their oxidizer supply. All seemed to go well, but the results were not good enough to proceed with a flight test as originally scheduled. UCLA did buy two of our RRS standard alpha rockets which were custom painted in the blue and gold colors of the UCLA Bruins. At the end of the long day, UCLA opted not to fly their two RRS standard alphas and save them for another flight. 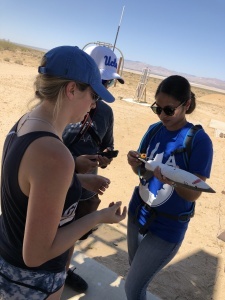 The RRS and UCLA discussed flying an altimeter chip in a vented payload tube on the next UCLA flight of the RRS alpha. 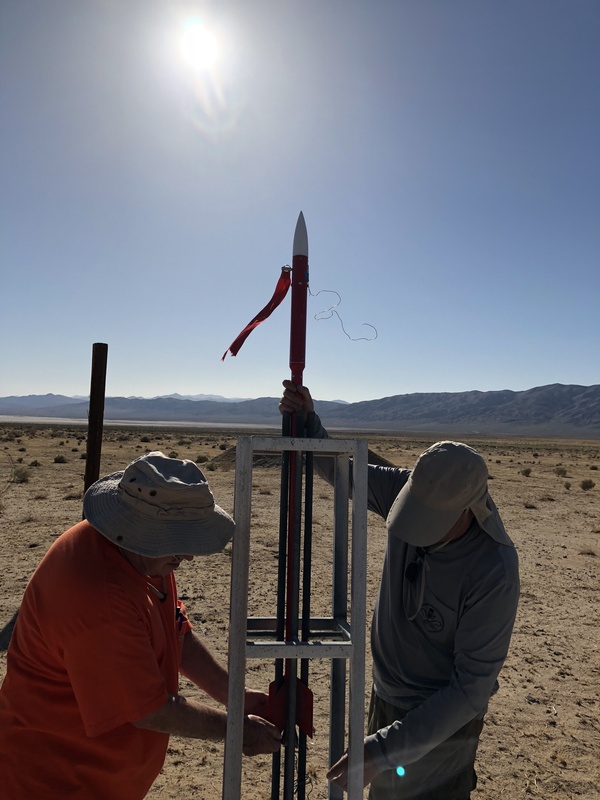 The RRS already had the micrograin propellant mixture ready so we proceeded with a flight test of our own RRS alpha rocket. We had plenty of daylight left in the summer month of June. For those that stayed at the MTA into the late afternoon, the RRS did conduct a first test of a payload recovery system in a standard RRS alpha rocket. This system was built by RRS president, Osvaldo Tarditti. An RRS alpha with its payload being installed. 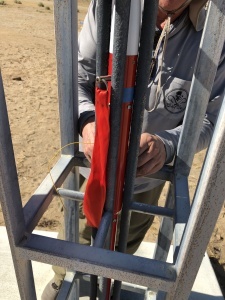 Instrumented RRS alpha in the launch rack. 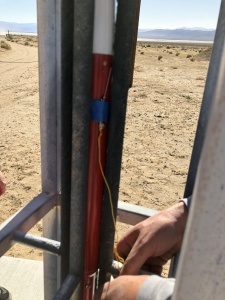 A manual switch with red flag is used to arm the system before launch. This keeps the battery from depleting while waiting to launch. 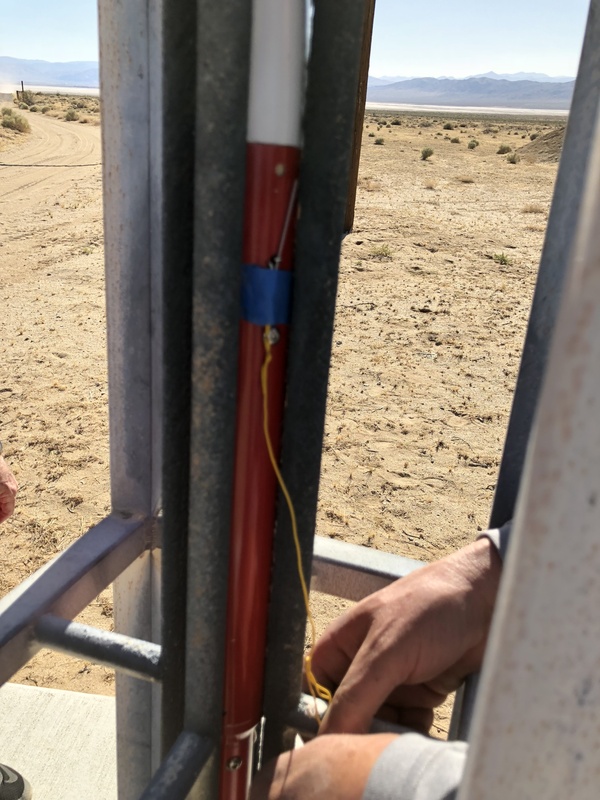 The payload timer is started when the rocket lifts out of the launch rails and the pin is pulled out by the yellow wire tied off to the launch rails. Despite some problems initializing the payload one the first attempt at the launch rack, the rocket was successfully reset, reloaded and flown. 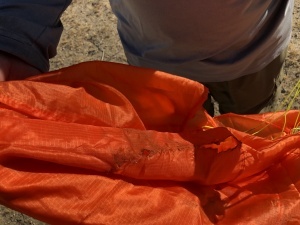 The deployment of a parachute from inside an RRS standard alpha rocket’s payload tube with a successful recovery was the only objective of this flight. In the still winds, the rocket didn’t drift very far from due west and the orange parachute was very visible against the clear blue afternoon skies once it reached lower altitudes. 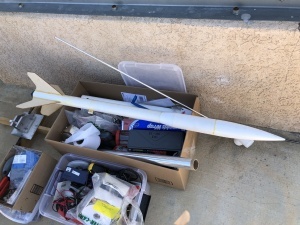 The alpha rocket booster portion was recovered, but the lanyard holding the nosecone and payload segment tore loose on deployment and was not recovered. Also, the orange parachute did show signs of localized overheating and melting from the 1-gram black powder ejection charge used to deploy the parachute. I took several photos of the assembly and loading process. 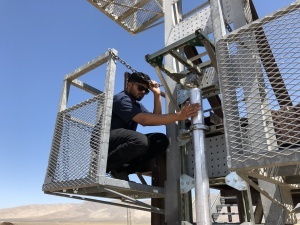 Osvaldo has promised to explain the full details of his parachute system and deployment timer. The RRS will definitely reattempt parachute recovery with our alphas and hope to fly again at the next event. As a final step, we make sure to burn off our residual propellants. 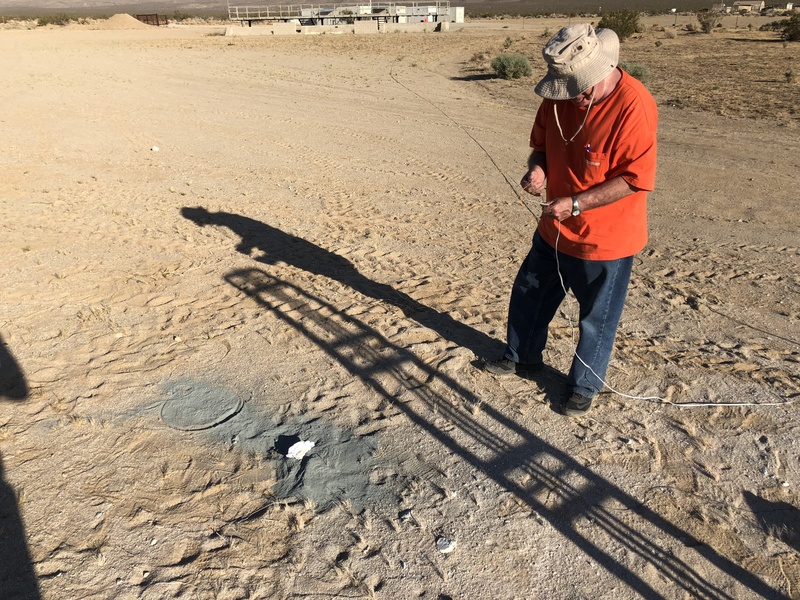 Jim Gross set this up near the launch pad and used the firing system already in place at the bunker. At the end of the propellant burn-off, the smoke cloud lazily lingered as it rose away from the site. Taking several minutes to do so, this was a very visual reminder of just how favorable the winds were that day. The next monthly meeting is this Friday, June 8th at 7:30PM. Discussion of the UCLA event and our next event with LAPD CSP will certainly be on the agenda. 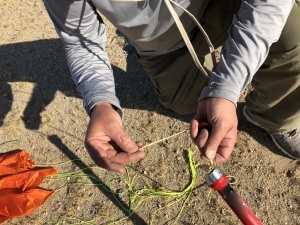 This entry was posted in Firing Report and tagged alpha parachute, commercial motors, HTPB fuel grain, hybrid motor, Interface Force, micrograin, MTA, nitrous oxide, pyro-op, RRS, standard alpha, UCLA by Dave. Bookmark the permalink.